Brussels (AFP) - Belgian Philippe Gilbert, who broke a kneecap in a spectacular crash on the Tour de France, posted on social media on Thursday that he has climbed back in the saddle. "First time on the bike after my crash," he wrote on Twitter and Instagram. "Hope to be back in action this year." 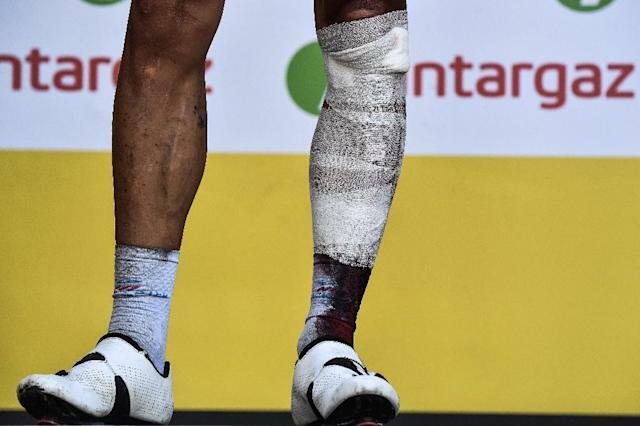 Gilbert accompanied the post with a video that included him flying over a wall during a high-speed descent, giving a brief interview, showing off the scars on his left knee and riding a stationary bike. The 36-year-old former road-race world champion crashed on the descent of Porte d'Aspet in the Pyrenees on July 24 and fell into a ravine. He was hospitalised in Belgium anticipating a long convalescence. Quick-Step manager Patrick Lefevere told the Belga news agency that Gilbert hoped to ride in the Tour of Turkey (October 9-14) and the Tour of Guangxi (October 16-21).